On October 23, 5 members of the Henan Province Cultural Relics Bureau, who were in Japan on invitation from the Nara National Research Institute for Cultural Properties, visited the Institute to see its facilities and to exchange opinions. After receiving explanations about the profile of the Institute and projects for international cooperation from the Director of the Japan Center for International Cooperation in Conservation, the group visited the Analytical Science Section and the Restoration Studio as well as the Radiography Lab of the Center for Conservation Science and Restoration Techniques and saw the exhibit of materials on the Kitora Tumulus displayed in the lobby on the first floor. The Director of the Center for Conservation Science and Restoration Techniques and persons in charge of the different facilities provided explanations and answered questions. On October 19, 10 students from Yasuda Gakuen Junior High School and High School in Sumida-ku visited the Institute as part of their study theme, “learning about the traditions of Japan.” They visited the Analytical Science Section and the Restoration Studio of the Center for Conservation Science and Restoration Techniques and saw the exhibit of materials on the Kitora Tumulus displayed in the lobby on the first floor. After listening to explanations by persons in charge and having their questions answered, the group visited the Kuroda Memorial Hall where they also listened to explanations and had their questions answered by a person in charge. Since the previous fiscal year, the Institute has been conducting a joint investigation and research of the national treasure Hikone Byobu with the Hikone Castle Museum. For over 100 years, this painting had been disassembled and mounted as six separate panels. Moreover, there were stains and the pigment layer was progressively flaking. Due to these reasons, two years were spent in conducting full-scale restoration as a part of the System for Protecting Cultural Properties and under the guidance of the Agency for Cultural Affairs. As a result, the painting was remounted as a folding screen. 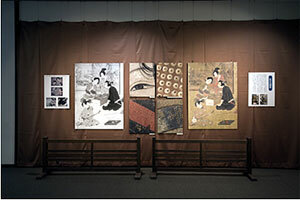 Since the restoration has been completed successfully, an exhibition of the restored folding screen was held as a part of the memorial project for the 400th anniversary of the construction of Hikone Castle. Part of the results of optical investigation conducted on this painting was also introduced in large panels during the exhibition, which was held from September 28 to October 26. Detailed images that allow one to observe the delicate and microscopic expressions brought about by extremely outstanding painting skills as well as directions for colors and under-drawings invisible to the naked eye attracted many visitors and were well-received by them. Presently, a report on the results of the investigation is being prepared for publication by the end of this fiscal year. There were not many researchers like Pelliot who investigated the documents in the caves where they were actually discovered. Preparations are being made now at the Department of Research Programming for the International Symposium on the Conservation and Restoration of Cultural Property that the Department will hold next fiscal year. After repeated discussions among members of the Department concerning the theme for this Symposium, it has been decided to look at cultural properties again with “the original” as the key word. For instance, although in the world of cultural properties “the original” is always an object of admiration, as is evident in activities related with reproduction, people’s understanding of what “the original” means varies from time to time and region to region. In such circumstances, we hope to tackle the question of how we are to transmit　cultural properties to others, especially from the point of view of cultural archives with which the Department is concerned. 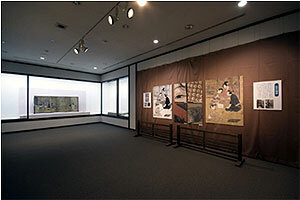 As a result of five discussions held before establishing the theme, it was decided to hold workshops on matters associated with “the original.” The first meeting was held on September 26 and Nakano Teruo (Department of Research Programming) presented a case study on the authenticity of documents on Dunhuang. 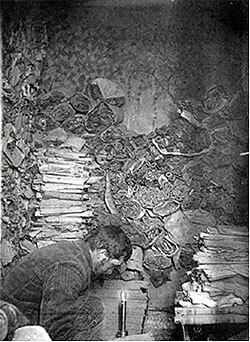 These documents were found stacked in big piles at the Dunhuang Mogao Grottoes in 1900 but were later taken out of China repeatedly by adventurers and researchers from abroad. For this reason there are confusions concerning these documents, including the question of their authenticity. 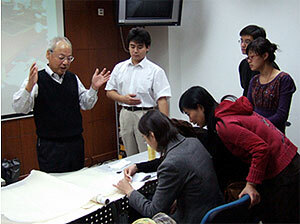 The group then held discussions on Dunhuang studies with Kato Masato of the Center for Conservation Science and Restoration Techniques serving as a commentator. On October 3, the group discussed the differences in the concept of “the original” between tangible and intangible cultural properties, focusing on bunraku and other classic performing arts, with Ijima Mitsuru of the Department of Intangible Cultural Heritage. In this discussion it was confirmed that in the case of intangible cultural properties the “original” is a matter that cannot be ignored in transmitting cultural properties for there is always the question of what is “the original” – is the way of the first performance in past history “the original” or is each performance considered “the original”? We hope to hold workshops on this theme from time to time and to develop them into the International Symposium next year. 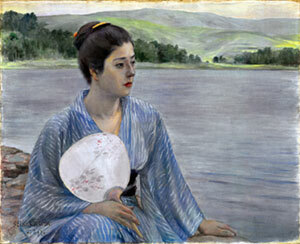 This fiscal year the Department plans to publish a report on the results of multi-faceted research on Kuroda Seiki’s Lakeside (Important Cultural Property, 1897, oil on canvas) as part of the Department’s research project “Research on Materials for the Study of East Asian Art.” With this purpose in view, 6 experts from outside the Institute were invited on October 12 to a conference that was held to present an interim report. Presentations were made on topics related to this widely known painting, such as the background for its creation, history of its evaluation, history of the actual creation of the painting and the present condition of the painting, followed by active discussions. Much is expected of such in-depth and multi-faceted research on one work. Investigation was made of the 49th Kinki, Tokai, Hokuriku District Folk Performing Arts Festival that was held on October 28 at the Kamitonda Cultural Hall in Kamitonda-cho, Wakayama prefecture. This was one of the many investigations of folk performing arts festivals that are held every year in various parts of the country that the Intangible Folk Cultural Properties Section of the Department of Intangible Cultural Heritage conducts from time to time. This year the operation of this festival had been reviewed and it was decided that the district would be divided into two and the prefectures in each sub-block would participate in the festival in alternating years. This year 8 groups from 6 prefectures participated. Since this was the first year in the new way, people were interested in how the festival would be operated. Fortunately, there was full-house attendance and comparatively sufficient performance time was secured in comparison with last year. Thus, the festival was confirmed to have been a success. 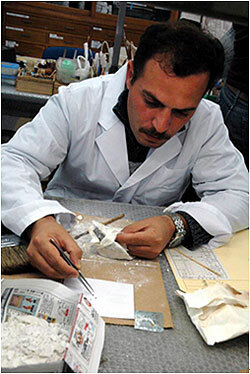 The Post-Seminar Course for Museum Curators is held once a year to curators who have completed the Seminar Course for Museum Curators that is held for two weeks every July in order to give them information about the most recent conservation techniques. This year, it was held on October 29 and 62 of the approximately 540 people who completed the past 24 Seminar Courses participated. During the Post-Seminar Course, 3 participants were asked to speak on the results of their respective museum’s work to improve the museum environment that was conducted in cooperation with the National Research Institute for Cultural Properties. Two researchers of the Institute provided supplemental comments and explanations. For the participants this was one of the few opportunities to learn about the actual situation at other museums. They listened with much interest, overlapping what they heard with their own work, and actively took part in discussions and exchange of opinions. For us, too, it was a joy to realize that the Seminar Course for Museum Curators and other activities of the Institute have born fruit. We hope to continue to communicate information related to the conservation environment. The Center for Conservation Science and Restoration Technique of the National Research Institute for Cultural Properties holds a joint research on the effect of environmental pollution on cultural properties and development of conservation techniques with the National Research Institute of Cultural Heritage, Korea. 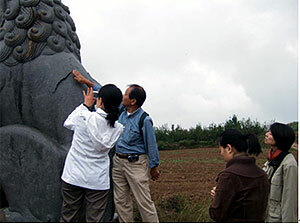 In this research, investigation is made of stone cultural properties, particularly on the conservation of stone Buddhas. As a part of the project, a workshop is held once every year in alternating locations so that researchers may be able to discuss their investigation more closely. This year, the workshop was held on Thursday, October 13 in the conference room on the basement floor of the National Research Institute for Cultural Properties, Tokyo. Researchers were invited from Korea and gave lectures on such topics as the diagnosis of deterioration and conservation environment of stone cultural properties and case studies on the removal of graffiti. 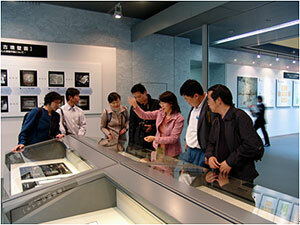 Meaningful discussions were held by everyone on the conservation of stone cultural properties. Following the workshop, all the participants visited the Kansai district to investigate the conservation condition of stone cultural properties and their surrounding environment. In spite of the bad weather, we were able to investigate and discuss many stone cultural properties within the limited time allowed. We hope to continue this type of joint research in the future and that we may be able to hold deeper exchange of research between Japan and Korea. The four Iraq experts who arrived on 19 September, 2007 received several basic lectures on conservation science and practical training on conservation of wooden objects at the National Research Institute for Cultural Properties, Tokyo. They stayed in Tokyo from the end of September to the end of October and joined the practical training of conservation for waterlogged wooden objects from 29 October to 9 November at Shizuoka Research Institute for Buried Cultural Heritage. At Shizuoka, the Iraqi experts experienced lifting fragile wooden objects during archaeological excavations at Sumpu site. 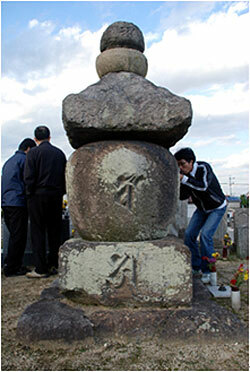 They also studied conservation methods such as stabilization using PEG and vacuum freeze-dry method, cleaning, adhesion, and filling at the Shimizu Office of the Shizuoka Research Institute for Buried Cultural Heritage. They will receive practical training on using various conservation equipments at the Institute in Nara. 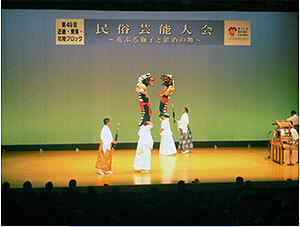 At the end of this training program, they will conduct a presentation of their works on 10 December, 2007 in Tokyo. 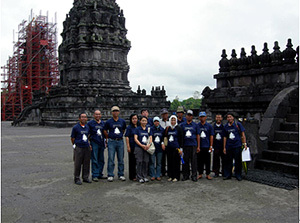 The Japan Center for International Cooperation in Conservation cooperates in the project to support the rehabilitation of the Prambanan Temple Compounds, a World Heritage Site, that was damaged in the earthquake which struck central Java on May 27, 2006. 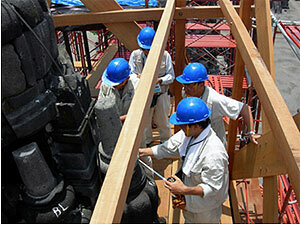 With the completion of the construction of the scaffolding for Garuda Temple, undertaken by Grant Assistance for Cultural Grassroots Projects fund of Japan, the third mission was dispatched from October 22 to November 4, 2007. In this mission investigation centered on Garuda Temple, whose partial dismantlement has begun. In addition to checking the condition of damage of the upper part of the temple and the inner structure, documents related to past restorations were collected and studied, and interviews were held. Hangsa Temple, which is similar in structure to Garuda Temple, was chosen and monitoring by seismometer was started to elucidate the dynamic characteristics of the structure. These investigations were undertaken with the cooperation of the Archaeological Heritage Preservation Office Yogyakarta and Gadjah Mada University. Now geometrically modified images of each of the sides of the temple are used to indicate the condition of damage of each stone, the method of restoration and areas of dismantlement in order to prepare a detailed plan for restoration that is within a standard which will make the estimation of the cost possible. Methods for structural reinforcement based on the results of analysis of the structural characteristics of the temple will be examined and a plan for restoration will be made during this fiscal year. The joint program to train Chinese personnel engaged in the protection of cultural properties along the Silk Road was held from October 8 to December 27 at the China National Institute of Cultural Property in Beijing. 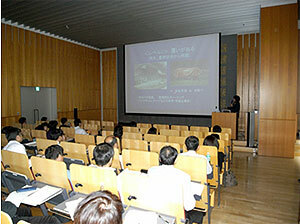 In the “Paper Cultural Properties” course, the training course for the second half of 2007, experts on paper cultural properties from China and Japan gave lectures. From Japan 12 experts went to China for 10 weeks to give lectures on various topics related to paper cultural properties and guidance on practical work. There were lectures not only on the traditional materials and techniques of paper cultural properties as have been clarified by modern science but also on new western methods of conservation. Efforts were made so that the 12 participants from areas along the Silk Road might acquire much knowledge and experience. In the conservation project for the stone statues of the tombs of Tang dynasty, which has been conducted jointly with the Xi’an Centre for the Conservation and Restoration of Cultural Heritage since 2004, a workshop is held once a year to which Chinese and Japanese experts come. This year, the fourth workshop was held at Xian from October 11 to 13. From China, researchers in charge of stone cultural properties from the Longmen Academy, with whom the Center also holds joint study on the protection of cultural heritage, participated. With the termination of projects with the institutes at Xi’an and Longmen next fiscal year close by and the restoration work entering its final stage, case studies were presented and discussions were held on the theme of “conservation techniques for stone cultural properties: methods for the conservation and exhibition of stone cultural properties – cosmetic treatment for the joints and the surface in the process of conservation” Mr. Ebisawa Takao (The Ethos), who is well experienced in the restoration of stone cultural properties, was asked to join from Japan.